In this workshop, held at the C.G. 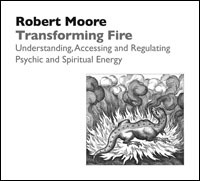 Jung Institute of Chicago in June 2002, Dr. Moore shares his recent research and reflections on the dynamics and transformations of “the fire within.” How a person experiences his or her life—filled with abundance or scarcity, flatness or flooding—depends to a degree on how well he or she can access and regulate the psychic and spiritual energies of the soul. This presentation consists of lectures, with discussion and experiential processing. It is appropriate for both professional therapists and advanced students of personal and spiritual transformation.